A market town in Wales has become the first in the UK to be officially twinned with a Nepalese village. Gurkha soldiers have been based in Brecon, Powys, for the past 45 years and about 80 Nepalese families have made their home in the town since. 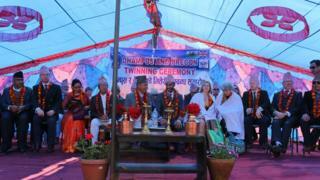 The town has now be twinned with the village of Dhampus at an official ceremony in the Himalayan nation. The event was attended by locals and delegates from Brecon council and it is hoped the move will boost tourism. Maj Khusiman Gurung moved from Dhampus to Brecon in 2011 to take on the role of Gurkha Major of the 1st Battalion of the Royal Gurkha Rifles. He said: "This twinning is very significant for us. It is an historical achievement for Dhampus to be the first town or village to be twinned with a town of the United Kingdom and we are very grateful to make that achievement. "The community of Dhampus is very excited, happy and grateful to now be twinned with Brecon. The celebration we had in Dhampus will be remembered for many years." The Gurkhas are a group of Nepalese warriors who have served the crown for more than 200 years. Their service was officially transferred from the Indian Army to the British Army in 1947. Was Lumley campaign good for Gurkhas? Powys county councillor David Meredith proposed the idea of twinning Brecon and Dhampus. He said: "Dhampus was chosen for two reasons. It was one of the first places I visited, but also a number of Nepalese people living in Brecon are from Dhampus and it seemed the sensible place to link with. "It's absolutely amazing because when you're up in Dhampus it's like climbing Pen y Fan and looking down over Brecon and surrounding communities. It's like for like. They are very similar. "Dhampus only has a population of 3,000 so it is much smaller but nevertheless it has similarities with Brecon."